Price is per 15-inch strand of these beautiful beads. Each measures around long 29mm x 10mm - about 12 to the strand. No gemstone is more creatively striped by nature than agate – technically, chalcedony quartz forming in layers in a wide variety of color and texture. Each individual agate forms by filling a cavity in its host rock, resulting in round nodules, with bands like the rings of a tree trunk, looking like eyes. 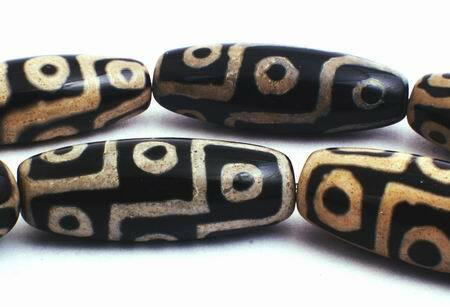 Dzi agate is possibly the most mysterious of all beads. These shiny beads, patterned with mystical eyes are among the most treasured in the world. “Dzi” in Tibetan means: "shine, brightness, clearness, and splendor. Agate was highly valued as a talisman and a traveler’s amulet since ancient times. It’s believed to bring good fortune, health, wealth and long life - as well as quenching thirst and preventing fever. Persian magicians used agate to divert storms, and athletes to increase vitality. It's also said to bring self-confidence by reducing fear. Some call its strange patterns 'cosmic caterpillar tracks'. Others' swear that wearing these beads can heighten the spiritual consciousness and balance the body's physical and mental states.